Christine Sefolosha is an oneiric or dream traveler. There are some artists whose work drifts like a dark voluptuous flower over the unseeing ant-like hordes of the art mainstream. It ravels and unravels histories. It moves even as it seems to be stationary on board, canvas, or paper. This art in a way, is about travel. We look to the distant horizon or up higher in the skies and see shivering roiling concentrations of energies: birds, clouds of dust, storms, insects, demons, angels, all indistinct in the chiaroscuro seconds before attaining form and disappearing in darkness. The unknown appears as a swarm of ectoplasm with an inner intelligence all its own. It is the open and aware traveler who sees it - not the tourist - the traveler. “Whereas the tourist generally hurries back home at the end of a few weeks or months, the traveler belonging no more to one place than to the next moves slowly over periods of years, from one part of the earth to another. Indeed, he would have found it difficult to tell, among the many places he had lived, precisely where it was he had felt most at home.” Paul Bowles, The Sheltering Sky. Christine Sefolosha is just such a traveler. She raises new challenges constantly. She asks that we open ourselves to the intentional freedom of the observations of a consummate artist whose psyche is in constant flux, who is at home everywhere and nowhere in the world, in the art world, on the precarious contemporary world, who, in Kurt Vonnegut’s immaculate phrase, has become “unstuck in time” like Billy Pilgrim in the novel Slaughterhouse Five. We see Sefolosha as an often out-of-body expatriate. A visual wanderer. She is not a shaman. She is an artist. She is an animist. Animism is the imbuing of life and internal forces to non-human objects and entities. Sefolosha and other visionary artists translate animistic tendencies and impulses into idiosyncratic visual languages. 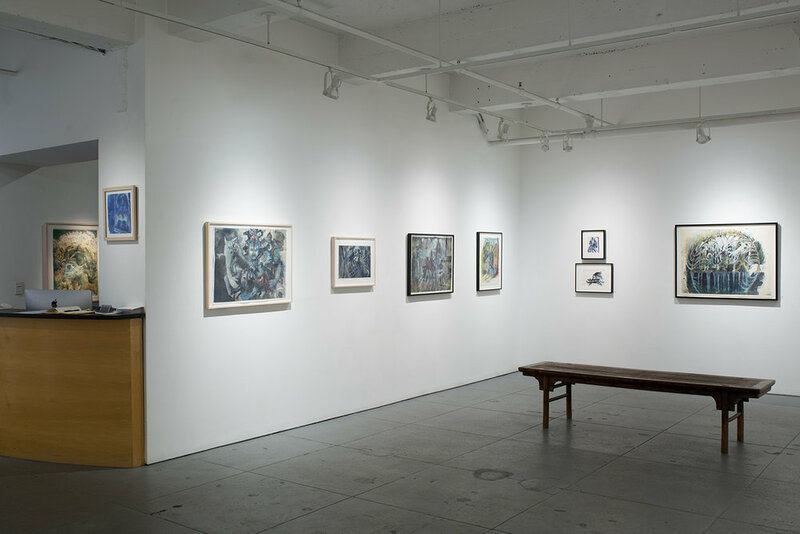 Cavin-Morris Gallery is pleased and privileged to present an exhibition of works on paper by an artist we have watched and loved for almost twenty years. She is unique. She is powerful. And she is generous in allowing us, through these drawings, to dream and travel with her.